The industry leader of subscriber-defined client-focused real-time virally-distributed dot-com front-end branding. You can’t really see the little bits of M&M floating in the smoothie, so I put some on top of the whipped cream for added visual interest. 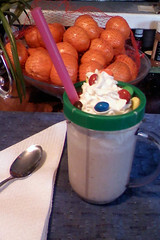 This one is made with banana, vanilla ice cream, milk (rice, soy, or dairy will work), and peanut butter M&Ms in a blender; topped w/whipped cream and whole M&Ms. I could have added some peanut butter to the smoothie, but the peanut butter M&Ms took care of that. (Mmmmmmm… peanut butter banana….. Yummy!) Oh, and make sure to use an extra width straw, otherwise the M&M bits will get lodged in a regular sized one. One of the Café’s less adventurous dishes, but still worth trying. Why don’t you check the menu now? This entry was posted on Saturday, May 2nd, 2009 at 20:03	and is filed under Cafe. You can follow any responses to this entry through the RSS 2.0 feed. Both comments and pings are currently closed.